I thought I had done a post about my annual “Preparation For Total Consecration According To St. Louis Marie De Montfort.” This is an annual devotion that I would recommend to anyone who wants to make a special effort to develop their interior spiritual life and do it with the help of our Blessed Lady. There are several times during the year when you can start the devotion. Mine is in November. It was through the Blessed Virgin Mary that Jesus came into the world, and it is also through her that he must reign in the world. You can find a copy of the book I use on Amazon. It’s so important to be faithful in daily prayer but it’s sure not easy to do in a busy world and work day is it? However, we have the tools starting with our own memory. I’ve tried a lot of different tactics to make sure I remember the prayers that I choose to make as regular devotions. For example, I’ve made a laminated card to remind me to dedicate each hour of the work day to somebody or something. I’ve set a daily noon alarm on my phone to remind me to say the Angelus. Speaking of the phone, I’m using mine more and more for this purpose. For example, on my iPhone I have the iBreviary app which is great for Morning and Evening Prayer and the daily Mass Readings. Besides those prayers I also have in my Liturgy of the Hours book a number of prayer cards that I say. Today I found them all online and pasted them into a pdf that I emailed to myself so that I can save them on my phone. This will save me traveling with a large, heavy book now! 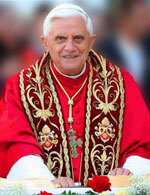 Yesterday Pope Benedict called on our Blessed Lady to protect families. Now is a great time to pray for all families and as usual, our Pope shows us the way. He spoke to a group of cloistered nuns.
. . . the Holy Father said: “To you I entrust my intentions, the intentions of the pastor of this diocese and the needs of everyone who lives in this land. In this Year for Priests I especially entrust you with clergy, seminarians and vocations. … Offer the Lord the sacrifice of your lives for their sanctification and for the good of souls”. Benedict XVI went on to invoke “Mary’s maternal protection” on “the Successor of Peter and the Church entrusted to his care. … Queen of peace, obtain the gift of harmony and peace for peoples and for all humankind”, he said. “Keep our families united, which today suffer threats from all sides, and make them centres of serenity and harmony where patient dialogue dissipates difficulties and contrasts. Watch especially over those that are divided or in crisis”. The Pope called upon the Virgin to “make the will of those whom the Lord of the harvest calls to be workers in His vineyard firm and decided, so that, resisting all the temptations and pitfalls of the world, they may persevere generously in following the path they have taken and, with your maternal help, be witnesses of Christ, attracted by the brilliance of His Love”. “Console those who weep, who suffer for human injustice; support those who waver under the burden of fatigue and look to the future without hope; encourage those who work to build a better world in which justice many triumph and fraternity reign, in which egoism, hatred and violence may end. May every form and expression of violence be overcome by the pacifying power of Christ”. Beautiful Video Prayer for Priests! I was asked today about how to live a holy life in today’s world. The implication being that it is difficult to do in a society that seems bent on removing religion from our everyday life and being focused on wealth and possessions while finding someone else to blame for everything without accepting personal responsibility. Yes it does seem difficult. It makes me think of a saying you see printed along with an image of Jesus that goes, “I never said it would be easy. I only said it would be worth it.” I’m not sure where that phrase comes from but I have thought of it often when trying to do something I know is right even when it isn’t easy. Like going to daily Mass when I’m traveling and in a city that I’ve never been to before and have a tight schedule due to the work that I’m doing. It is often not easy to do but after Mass I can truly say it was worth the effort! As a cooperator of Opus Dei one of the key elements that drew me to it to start with is centered in this concept of “Sanctification in Daily Work.” To sanctify is to make holy and that’s what we are called to do as lay people in “the middle of the world.” So to me, the idea of living a holy life involves doing what is right and I look to my faith to teach me that. Daily prayer done at specific times (first thing in morning and last at night). This can consist of the Rosary, morning offering, thanks before and after meals, etc. A short reading from scripture, especially the New Testament. A few minutes of mental prayer. A visit to Jesus in the Tabernacle. You should not let them become rigid rules, or water?tight compartments. They should be flexible, to help you on your journey you who live in the middle of the world, with a life of hard professional work and social ties and obligations which you should not neglect, because in them your conversation with God still continues. Your plan of life ought to be like a rubber glove which fits the hand perfectly. With our Lord’s permission I took a picture of Him in the Blessed Sacrament in our perpetual adoration chapel at the Cathedral of St. Joseph here in Jefferson City, MO. I highly encourage all parishes to consider beginning perpetual adoration if at all possible. I’m not sure when I started spending one hour a week with our Lord but it is the highlight of my week. There is not a more peaceful place than in the chapel alone with Him. Although perpetual adoration is normally structured so that people sign up for a specific hour each week, you may also make a visit anytime. If you’re not familiar with perpetual adoration, here’s some explanation from EWTN. 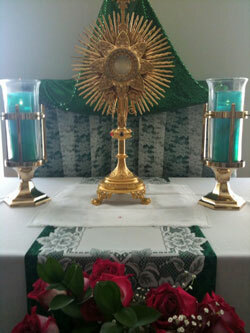 A monstrance is the vessel used to hold/display the Blessed Sacrament (consecrated eucharistic host). Perpetual Adoration is a Eucharistic devotion whereby members of a given parish (or other entity) unite in taking hours of adoration before the Most Blessed Sacrament (in most cases, exposed), both during the day and throughout the night, seven days a week. Why is exposition in the monstrance preferred? So you may wonder what you would do for an hour in perpetual adoration. Here’s some advice. This hour Jesus wants you to spend with Him is spent any way you want. You may bring your own prayer books, use the books in the chapel, read the Bible, pray the rosary, or just sit and relax and enjoy the sweet peace that comes from simply being in the Presence of God. Here are a couple of Twitter feeds you should start following. One is for Archbishop Eijk of Utrecht and the other is for FuturePriests.com. The Archbishop has issued a call for prayers for vocations on Twitter. If you’re Twitter savvy just use the #futurepriests hash tag in your tweets. On Friday, June 19, Dutch Archbishop Eijk of Utrecht asked the world to join in prayer for vocations to the priesthood – using Twitter. 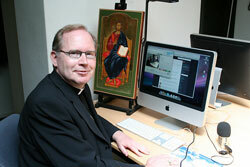 Using one of the computers of the archdiocesan seminary in Utrecht, the bishop launched a ‘Global Twitter Campaign for Vocations’ by posting a call for prayer on the fast-growing social network. In his message, he invites his Twitter-followers to spread the initiative around the world. for workers for the harvest. Happy Father’s Day to all Dads everywhere. My Dad is not a computer kind of guy so I’ll call him later today to wish him well. Let’s all say a prayer to the patron saint of fathers, St. I agree. So Dads, I hope you’re finding a way to spend time with your children. Even in today’s culture you can do simple things even after they’ve left home like call them, email them a message, send ’em a text message even. I love my wife and my children and today I also hope and pray for them. 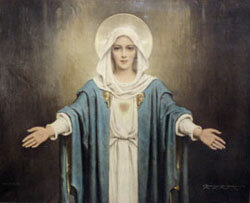 While it’s still the month of Mary I thought I’d post this image that I currently have in the sidebar. It’s a photo of a print we have hanging up in the adoration chapel at the Cathedral of St. Joseph here in Jefferson City, MO. The print is signed by Charles Bosseron Chambers and titled, “Most Gracious Advocate.” It’s one of my favorite images of our Blessed Lady. If anyone knows where you can find one of these prints please let me know. I’ve searched online but have not found this image of his. Here’s one of my favorite prayers which is a poem written by Mary Dixon Thayer. Archbishop Fulton Sheen made it very popular. Tell me for you know. Asking a saint for help with a particular problem is a long standing custom and for people who are looking for work I just found one on the Opus Dei website. You can find the full novena with this link (pdf). During these times of economic crisis, many people have lost their jobs and face serious difficulties supporting their families. With his teaching about the sanctification of ordinary work, St. Josemaría is a natural intercessor for all those seeking work or anxious about losing their job. Above is a link to a Novena for Work that thousands of people have used to ask St. Josemaría’s intercession for finding or keeping jobs. Use it yourself and send it along to any friends or relatives looking for work. Each day of the 9-day prayer starts with a quotation from St. Josemaria and then an intention for work or to do a good job. 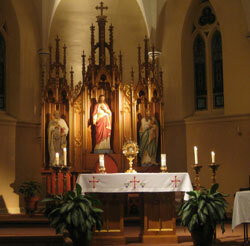 I just completed an evening of recollection at Immaculate Conception in Dardenne Prairie, MO. I’ll add a photo later since I’m posting this from my phone on the way home. Fr. Jay Alvarez gave two meditation talks on St. Paul’s call to be an Apostle and proclaim the Gospel, something we’re all called to do. Therefore, according to St Paul’s conception, what is it that makes him and others apostles? In his Letters three principal characteristics of the true apostle appear. The first is to have “seen Jesus our Lord” (cf. 1 Cor 9: 1), that is, to have had a life-changing encounter with him. Similarly, in his Letter to the Galatians (cf. 1: 15-16) Paul was to say that he had been called or chosen, almost, through God’s grace with the revelation of his Son, in view of proclaiming the Good News to the Gentiles. In short, it is the Lord who appoints to the apostolate and not one’s own presumption. The apostle is not made by himself but is made such by the Lord; consequently the apostle needs to relate constantly to the Lord. Not without reason does Paul say that he is “called to be an apostle” (Rm 1: 1), in other words, “an apostle – not from men nor through human means, but “through Jesus Christ and God the Father” (Gal 1: 1). This is the first characteristic: to have seen the Lord, to have been called by him. I did a little searching in the iTunes Apps Store and found a few more apps you might be interested in.